I purchased this baby almost a year ago and being that it was my first car, I needed a Jeep Wrangler, and any model would do. We went and looked at others but either the price was too high or something was wrong with it. Finally this one caught my eye. 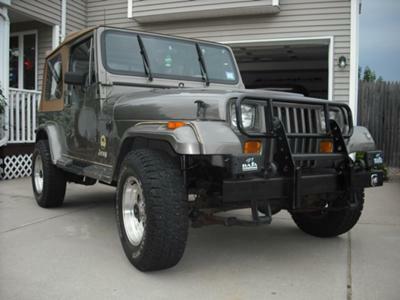 A 1988 Jeep YJ Sahara, hard top, stereo, full doors- everything but the soft top which I acquired later on. It took my father and I a few months to make a few necessary repairs but it was worth it. Everyone I knew wanted to see it. She's just so unique than other vehicles in my town. Honestly I don't need a license plate because it's one of a kind! The weather is almost too perfect to take the doors off and top down. Though it is a bit heavy on the gas money, it's worth every penny and drop to drive her. I dubbed her the name "Lulubelle" from the movie with Humphrey Bogart "Sahara", where there was a tank named "Lulubelle". That's what I think of her as, well, a tank. Got to go Jeepin now! Larry's Comment: Lulubelle looks pretty good there, especially for an '88. She has aged well indeed.